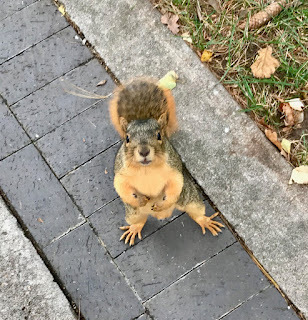 The Gentlemen's Monthly: Saturday Squirrel. Oh, they're around... our furry friends. Maybe our attention was elsewhere, but rest assured, their attention was always focused on us. Yes, they were watching us all the time, looking for a hand out here or a dropped food item there. Greedy? Probably, but can you blame them? Winter is coming, and they need the extra pounds to keep warm. And our furry friends desire to keep warm so much so that they are not afraid to approach us as we ambulate about campus. On seeing Fr. Ralph, this furry friend scurried across God Quad to non-verbal, "Can you spare a muffin top?"